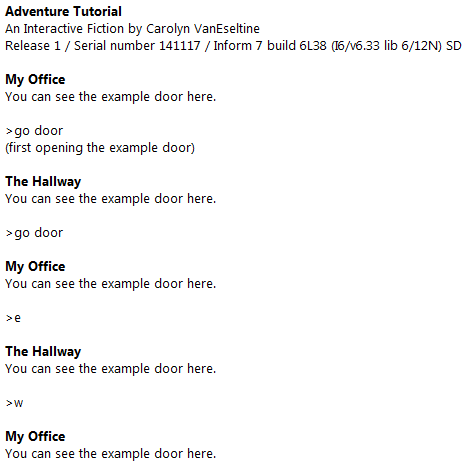 This is the third in a series of quick-start Inform 7 tutorials using examples from Colossal Cave Adventure. More information about this tutorial series can be found here: A Quick-Start Guide to Inform 7. There is a room called My Office. There is a room called The Hallway. A wooden door is a door. The wooden door is east of My Office and west of The Hallway. This will produce a basic door that you can walk through by way of a direction, or by entering the door. The player can open and close the door at will. The player will attempt to open a closed door automatically before walking through it, and the player will stop entirely if the door is locked. 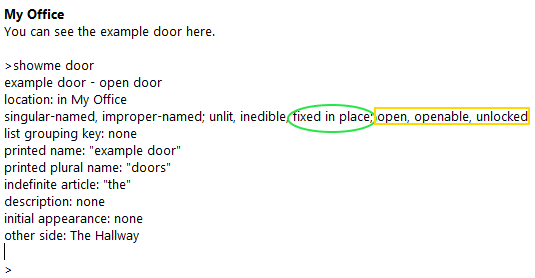 As with other things, you can learn about the properties of a door by using the SHOWME debug command. Doors are automatically fixed in place. Doors also have a few special properties of their own, including open/closed, openable/unopenable, and locked/unlocked. 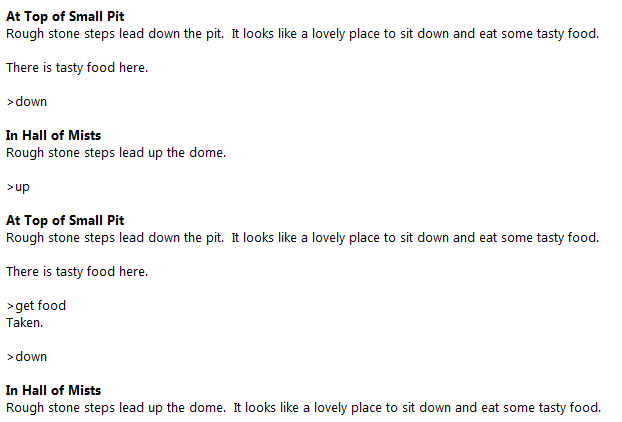 There is a room called At Top of Small Pit. There is a room called In Hall of Mists. Some rough stone steps are an open unopenable door. Some rough stone steps are down of At Top of Small Pit and up of In Hall of Mists. The appearance of the stone steps changes depending on whether you are in At Top of Small Pit or in In Hall of Mists. Altering text on the fly is an incredibly powerful tool that deserves far more attention than it will receive in this quick-start tutorial series. It is covered comprehensively in chapter 5 of the Inform 7 manual. 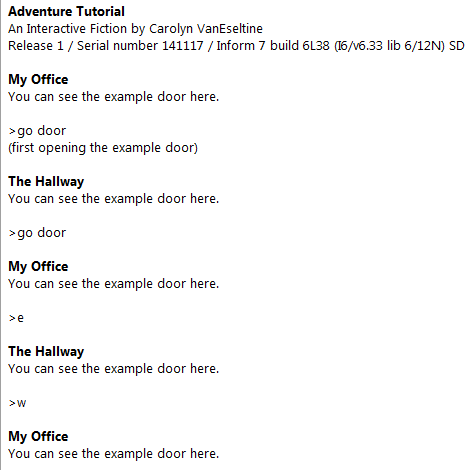 At the very beginning of Adventure, instead of going east, you can type “go building” to enter the building, so the building is clearly a kind of door. But once you are in the building, you cannot type “go building” to exit the building again. This is a one-way door. Here is an updated version of the code to connect End of Road and Inside Building. There is a room called At End of Road. The well house is an open unopenable door. The well house is inside of At End Of Road. Through the well house is Inside Building. Understand “building” as the well house. Outside of Inside Building is At End of Road. Note that “Inside of At End Of Road is Inside Building.” is no longer part of the source code. Leaving it in would produce an error, because Inform 7 would see that going inside from At End Of Road reached both a door (the building) and a room (Inside Building). There is a room called Outside Grate. There is a room called Below Grate. The steel grate is a locked lockable door. The steel grate is down of Outside Grate and up of Below Grate. Like doors, containers can be locked and lockable, and they can be unlocked with a matching key. This is useful in a wide variety of ways, although none of them are exemplified in Adventure.